Thailand is a country in Southeast Asia, located on the Indochinese peninsula. Its area is 198,000 square miles, with a population of almost 69 million people. Thailand is famous for its exotic nature and beautiful landscapes. Its territory spans diverse mountainous regions and river valleys. The country has a number of tropical islands, as well as sandy beaches and historical sites. That’s why it’s one of the most popular tourist destinations in Asia - and worldwide. Through the centuries, Thai culture and history have been influenced by India, China, Burma and Cambodia. The country was never colonized by Europeans like the rest of Southeast Asian states. After a long period of dictatorships in the 20th century, today Thailand is a constitutional monarchy. Thai economy is in the process of industrialization. It is rated as an emerging one, and is the second largest in Southeast Asia after Indonesia. The most important sectors that fuel its development are manufacturing, agriculture and tourism. Thai economy is dependent on exports, with rice, fish, textiles, and electronics among its top productions. The country also has a well-developed automotive industry. Tourism accounts for 6% of Thai economy. The urban population in Thailand is steadily growing. About 52% of Thai people live in cities. The other half of the population is rural and makes its living out of rice growing. The capital Bangkok has a population of 8.28 million people. 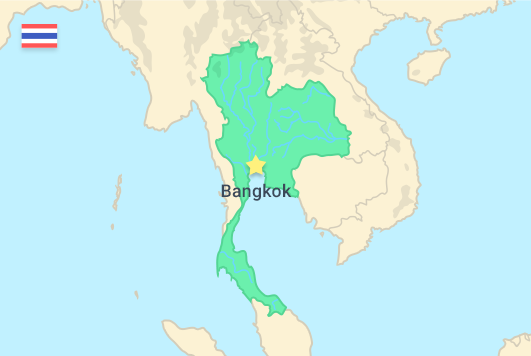 Other large cities are Samut Prakan, Mueang Nonthaburi, and Udon Thani. The majority of people in Thailand are Theravada Buddhists. The official language in Thailand is Thai. It has four main dialects. However, there are about 62 regional ethnic languages. The literacy rate is 96.7%. English is the popular language for trade and tourism. Thailand has numerous good quality universities spread out on its large territory. Some of the best higher education institutions are Kasetsart University Bangkok, Mahidol University, Chulalongkorn University, Chiang Mai University, and Naresuan University. There are a number of good technical universities as well. The top programs offered in Thai universities are in engineering and software development. Young professionals from Thailand prefer freelancing for international companies because of the higher income and access to better opportunities. Some of the most popular services they offer are in the fields of software development, customer service, translation and IT. The average monthly salary in Thailand is 94,233 THB ($2,800). Jobs in accounting and finance, as well as in customer service pay around 62,000 THB per month ($1,800). Professionals in engineering, IT and banking earn around 90,000 THB monthly ($2,700). Advertising and marketing specialists usually get around 110,000 THB per month ($3,300). Freelancers from Thailand are often based in cities, which means that their salary expectations would match the living costs in their urban area. The currency in Thailand is the Thai Baht. The current exchange rate is 1 USD to 33.25 THB. Money transfers to and from Thailand are available popular online payment services, including PayPal, XE money transfer, Payoneer, and Transferwise.